Irritable Bowel Syndrome, more commonly known as IBS, is a problem that many of our customers seek advice about. It is an increasingly common digestive disorder and the symptoms can include stomach cramps, bloating, diarrhoea and/or constipation. We find that it’s a combination of both male and female customers who are affected by this condition. The main causes, we find, tend to be food intolerances and sensitivity but also stress, anxiety and the everyday problems that people are faced with. When customers come to us asking for help with IBS we usually suggest that they try having a food sensitivity test. We have such tests available in store to check for intolerances and food sensitivities that customers may not know about. Microbiotics are another route we suggest our customers go down as they are packed with friendly bacteria that occur throughout the digestive tract. They are essential for proper digestion, strong immune function and overall health. We have a range of natural remedies in store that can help with IBS. Firstly, we have a product called Molkasan, which is rich in a substance known as L+ lactic acid, which is now known to support the growth of good gut bacteria. In this way, it acts as a prebiotic. Another option would be aloe vera juice. We have a wide range of different aloe vera juices on offer which are very good for calming the digestive area. They are recognised for their cleansing and purifying properties. We also have a product called GI Natural Digestion Perfection, which helps with symptoms such as heartburn, gas, bloating, diarrhoea, reflux and flatulence. We would offer specific advice to the customer based on their individual needs. In terms of dietary and lifestyle advice, this is very important but also very unique to each individual. Each person needs to find their own balance in lifestyle and nutrition. Food choices are very important – sometimes small changes can make a huge difference. Bitter herbs could be the best thing your gut ever experienced, as bitter tastes stimulate the production of digestive enzymes and stomach acid, helping you break down your food properly. They also have so many more benefits to them. As for lifestyle choices, it’s essential to take some time out here and there because IBS is closely linked with stress. Treating yourself to a massage or a stress-relieving treatment is the perfect way to relax and recharge your batteries and could help to calm your digestive disorder. We are always happy to help and advise customers on their individual health problems and will recommend any products that we think may help. 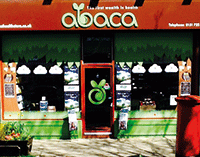 Abaca Health Store is located at 255 Woolton Road, Childwall, Liverpool, L16 8NA. It was first established in 1998 by founder Kathryn Lewis who continues to enjoy owning and managing the store. Kathryn and her team have a vast wealth of experience within the health and wellbeing industry and promise to do their utmost to advise and support their customers.